Building the Dutch Tool Chest has had some important lessons for me. 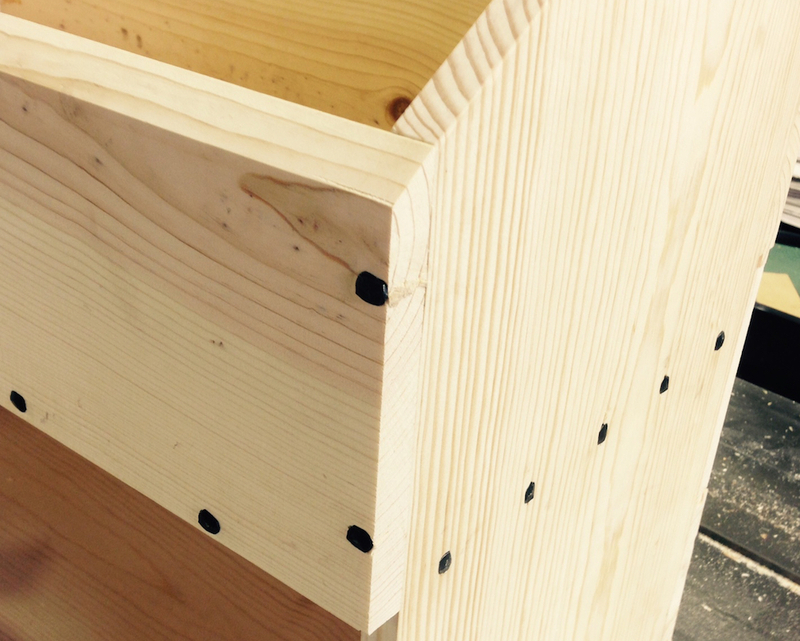 Aside from the obvious “make sure the dovetails all face the same way”. First, the one that bugs me most, is get decent lumber. I got Common Pine (“whitewood”, a very soft pulpy wood-like material), which cupped after I got it home. By the time I dressed it the “1 by 12″ (.749″ out the door) was closer to 5/8” thin. This doesn’t leave enough for nailing and dadoing in my view. It also continued to move around after it was flattened, and is super soft. I wanted Select Pine but the home center has been out for several weeks. A consequence of the soft, thin boards is that the cut nails I’m using caused blow out in several spots as they went into the pre-drilled holes. Wrought-head cut nails. I like the look, the blowout on the endgrain, not so much. Something else I’ll do differently is to put the back on after the drop-front is fitted so I can glue on the brackets for the sliding latch more easily. Drop front ready for battens and some shaping on the catches for the latch bar. I had a bit of a struggle with the boards on the back. I decided to go with tongue and grooves instead of shiplap. Problem #1 was my tongue and groove plane doesn’t make a joint that works right off the plane. The tongue is too big (or the groove too small). It’s problem with the cutter width, I’ll need to replace something there. I also installed the boards from the top to bottom. Bad call, I should have started at the bottom, and not cut the bevel on the top board until it was ready to go otherwise. Live and learn. One of the reasons I wanted to do this project was to dust off my hand tool skills and take a break from the crazy detail of marquetry. I tuned up my coffin smoother, it leaves a super surface now. That’s a great feeling, it works better than my metal smoother with a more carefully prepared blade. Smoothing parts for the drop front latch. This tool chest is going to get a coat of milk paint and go into service as storage in the house. I’ll make another one to use when I go to woodworking classes. Without grading on a curve, this will be a B-minus project when it’s done. Everything will be functional and square, but the details aren’t quite a nice as I’d like. I’ll do another with either select Pine, or maybe some VG Fir I saw at the wood store. 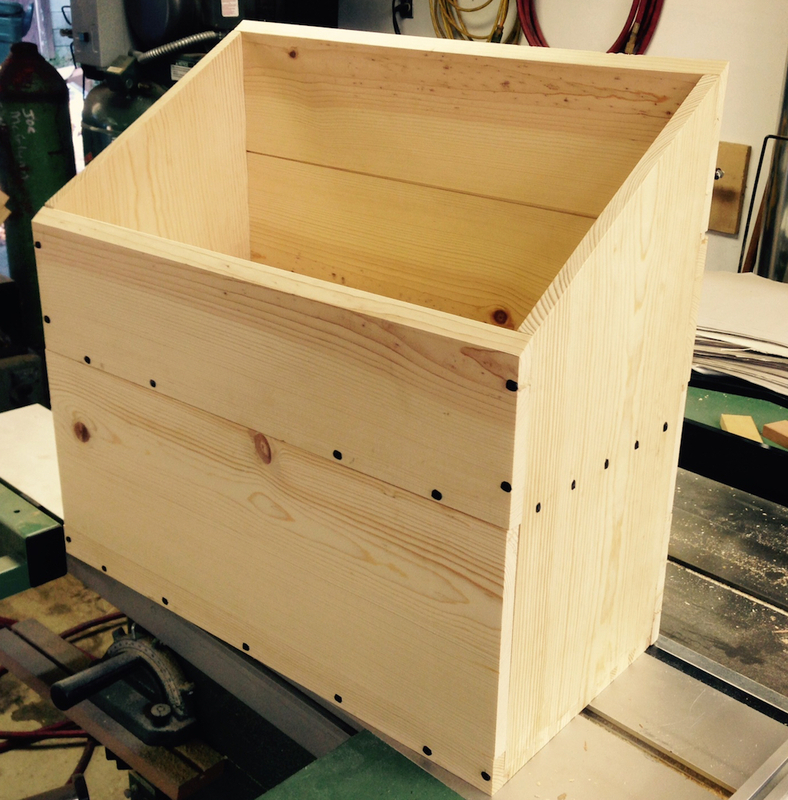 Just need to trim the lid and get some hinges to complete this one. 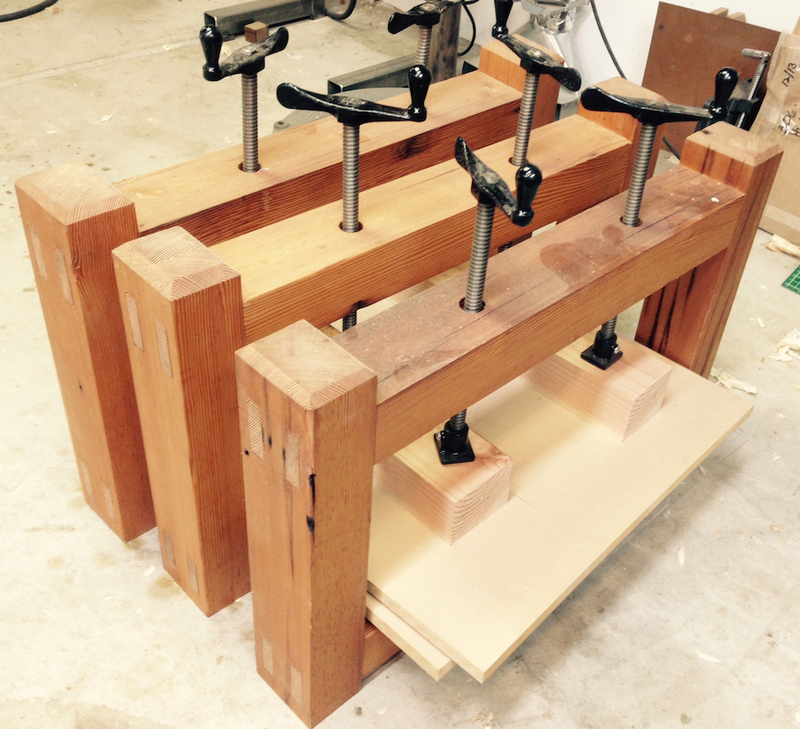 I’m eager to wrap up the Moxon vise project and put it to work. 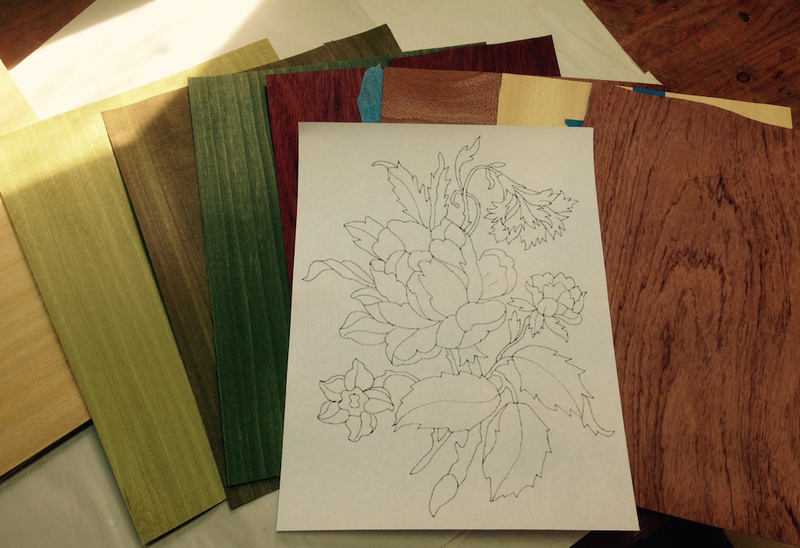 Remember, this is an enabling step toward the next marquetry project. And if you followed that logic, you’re in the right place here. Here is the high level view on this progress report. I’d done the woodworking bits already. Chopped hexagonal mortises for the front nuts, glued on the brace for the back, cut the decorative details on the ends and drilled holes for the acme rod. Check the comments on the last post for a great tip for inexpensive Acme rods and nuts. Hardware for the vise. I’m using 1″-5 acme rod, cut 11″ long. That’s one size larger than what most folks seem to use, but I wanted the visual scale just for aesthetics. …and one the clamps against the back of the read jaw. This is a very sturdy setup. For reference, the nuts are 1″ thick and 1.625″ across the flats. That’s a 2″ diamater x .300″ washer. I love nice hardware. So the next steps were really about final fit up, sanding (because that makes a great blog post) and doing the little bit of metalwork. My first step was to fix my TIG welder. It’s been down for probably 8 months, and I haven’t welded in probably a year or more. A far cry from when I had a small manufacturing business and welded nearly every day. That’s a lot of words to say “I’m out of practice”. 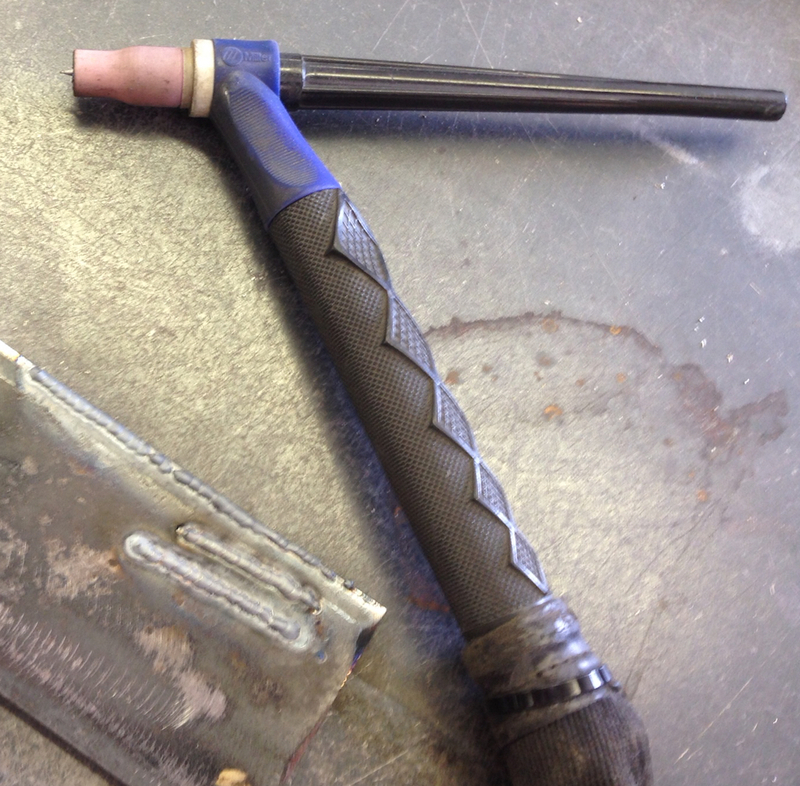 TIG torch repaired. The problem was the coolant return line was leaking. No one wants to weld while standing in a spray of antifreeze, trust me on that one. I’ll need to do some more metalwork projects to get back in practice. I’m sure I need some welded brackets and what-not for the shop. Once the welder was repaired I made up the wing nuts as I had them in the plans. 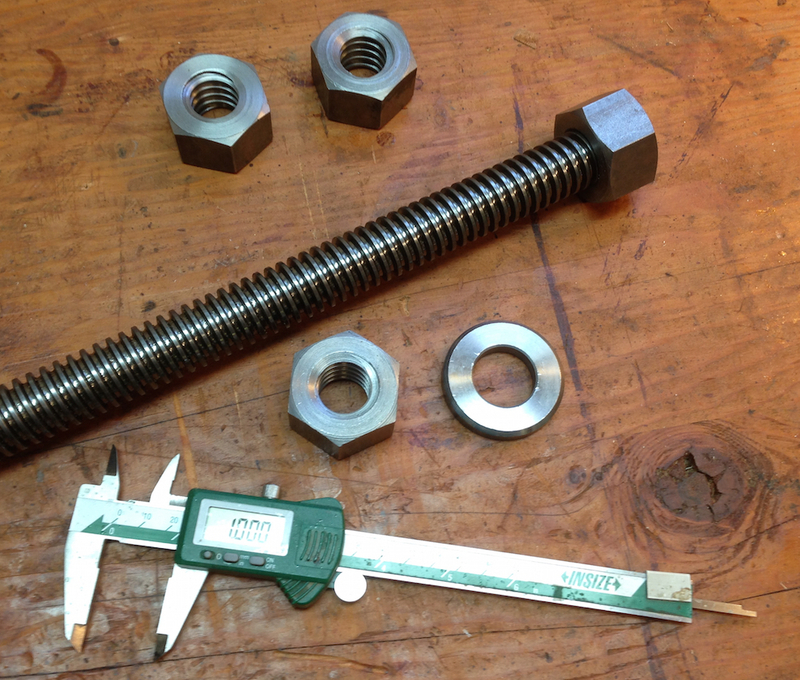 One large nut with two 1.5″ long pieces of 1/3″ round bar tipped up 30 degrees, and two 1″ steel balls. My welding on the was a little sloppy and inconsistent, but by the last bit I was starting to get into the swing again. 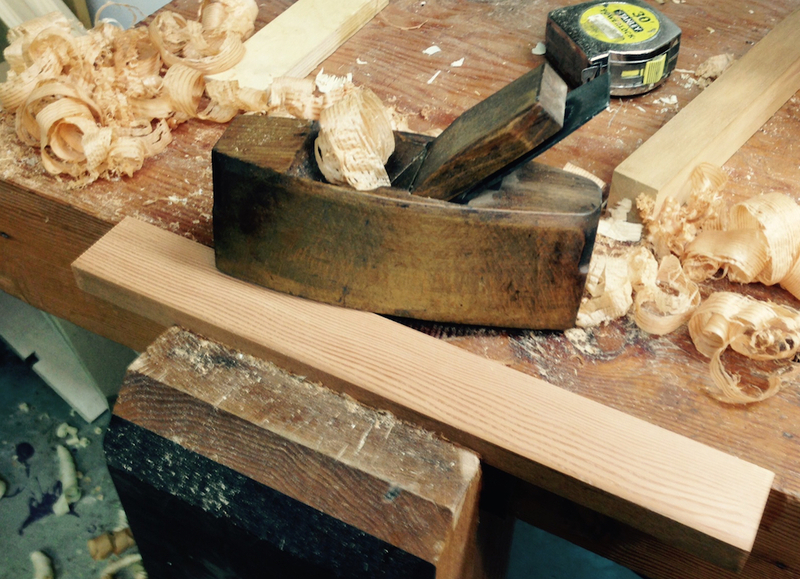 While I was working on making the handles I also sanded the vise and started applying finish. I’m experimenting with Tru-Oil after reading about it on the Benchcrafted blog. 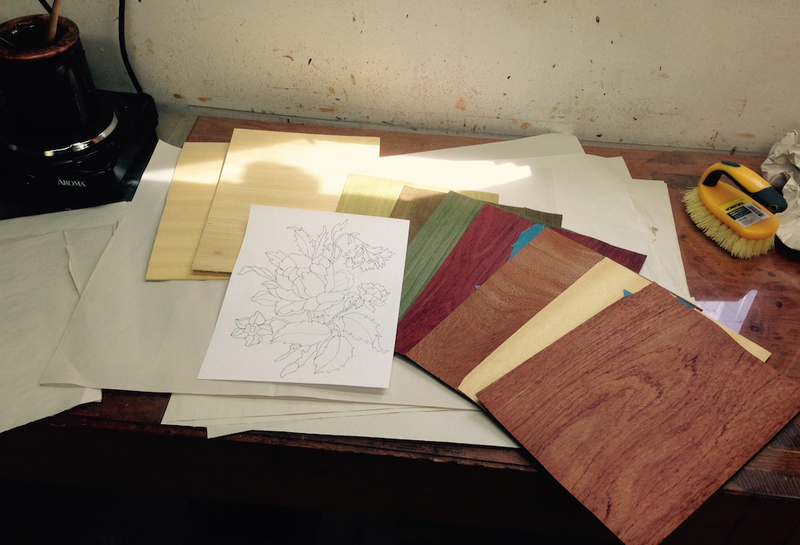 I’m always suspicious of finishes, after reading Flexner testing finishes it seems a lot of finishes are snake oil. I bought a bottle of Tru-Oil, and I really like it. This is probably my new favorite wiping varnish finish. It build fast and dries really quickly. Since this is a shop appliance, not furniture or a musical instrument like Jameel makes, I sanded to 220 just to remove tool marks. Then I wiped on two thin coats, and let that dry. I sanded with 320, then wiped on two more thin coats. I rubbed with 0000 steel wool, and wiped on one last coat. More than enough gloss, and with finer grits this would be even nicer. The thin coats seem to tack up very quickly — in 5 or 10 minutes — and dry to the touch within an hour. 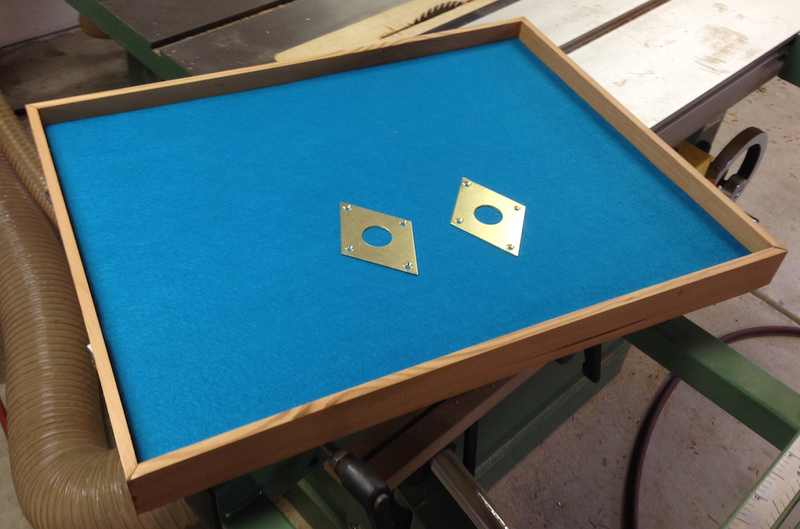 Then I installed the brass escutcheon plates I’d made. I’m liking it. 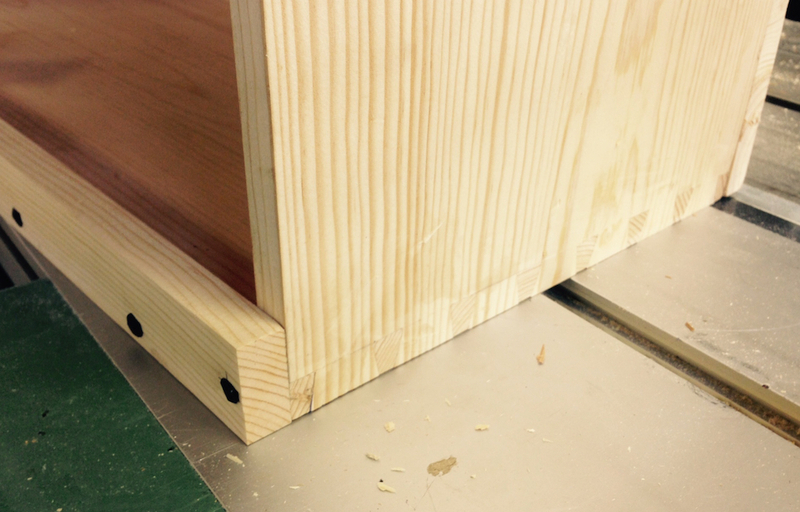 You’ll notice I did add a mild stopped chamfer for saw clearance whencutting half blind dovetails. I also cold-blued the wing nuts, I like the finish. Brass plates installed, I like it! Then I reinstalled the screws and the wing nuts I made, it seems to work pretty well. I need to glue some leather to the front jaw to help with clamping and then try this out — I wanted to give the finish overnight to fully cure. It’s not a perfect piece, I got some small chip out where I was rasping the cyma recta detail (backer board next time Joe! ), and there are a few other details that could have been better, but for a shop appliance I’m really pleased with it. Glamor shots in use to come. 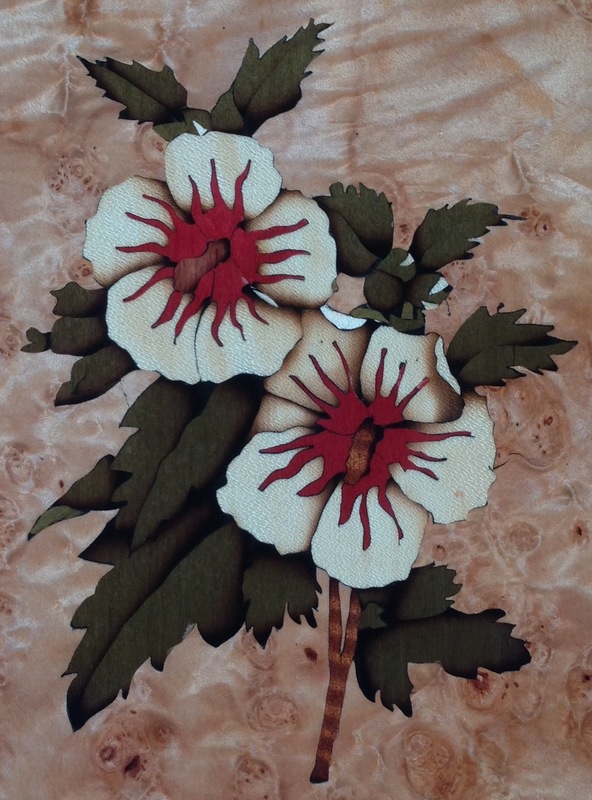 Simple project, just a felt-lined tray to hold marquetry pieces as I cut them out. Modeled after the trays at ASFM. 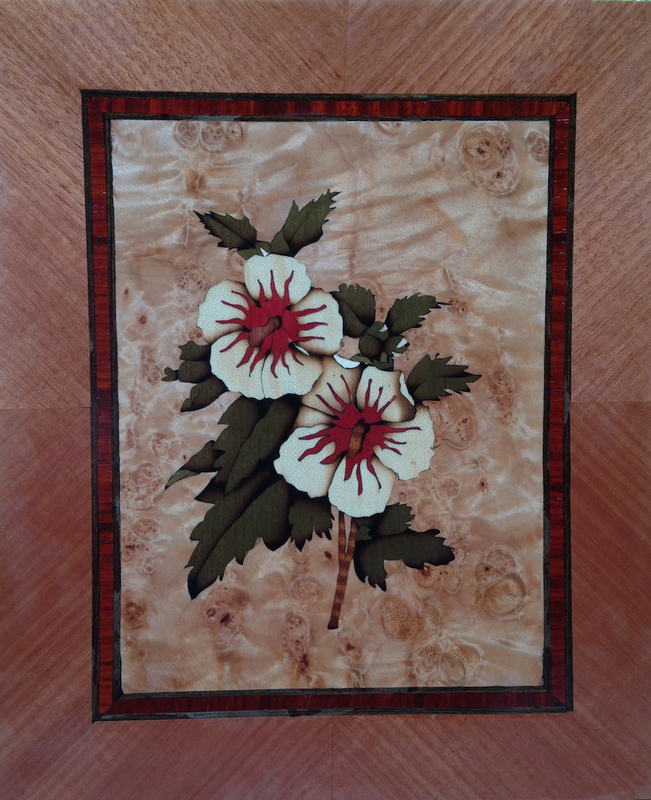 Made out of off-cuts of VG/OG Fir from the press and scraps of 1/4″ ply. Doesn’t everyone have turquoise felt laying around the shop? I was thinking… Three words that have lead to no end of trouble for me. 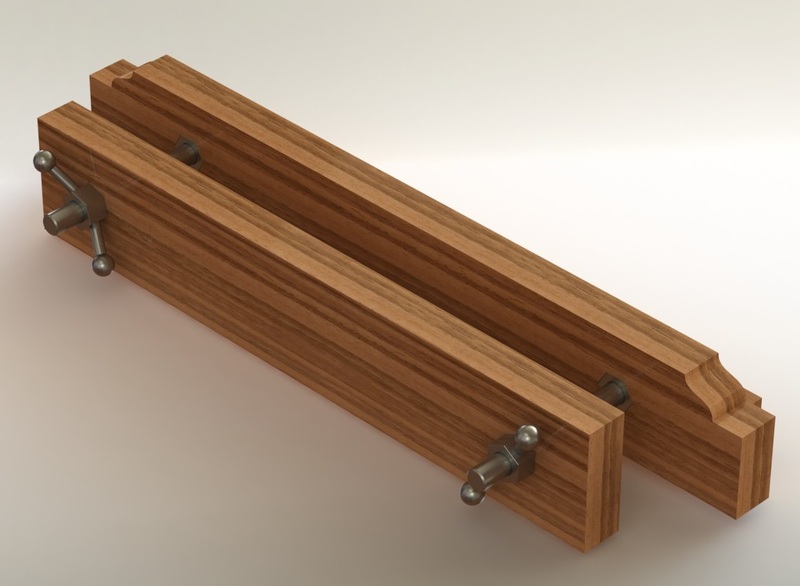 I was thinking about adding some embellishment to the Moxon vise. 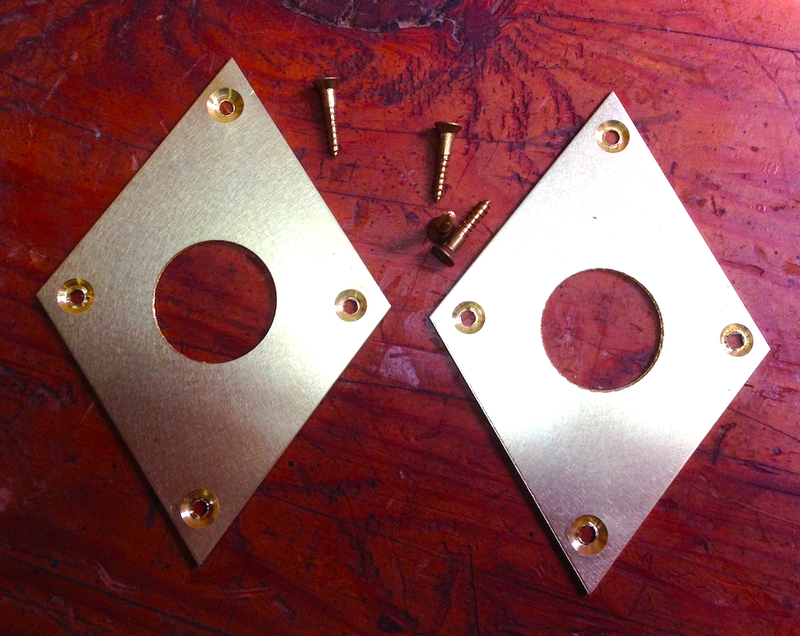 After thinking through a range of options from doing nothing to something approaching the tattooed lady I decided to add a pair of brass escutcheon plates. 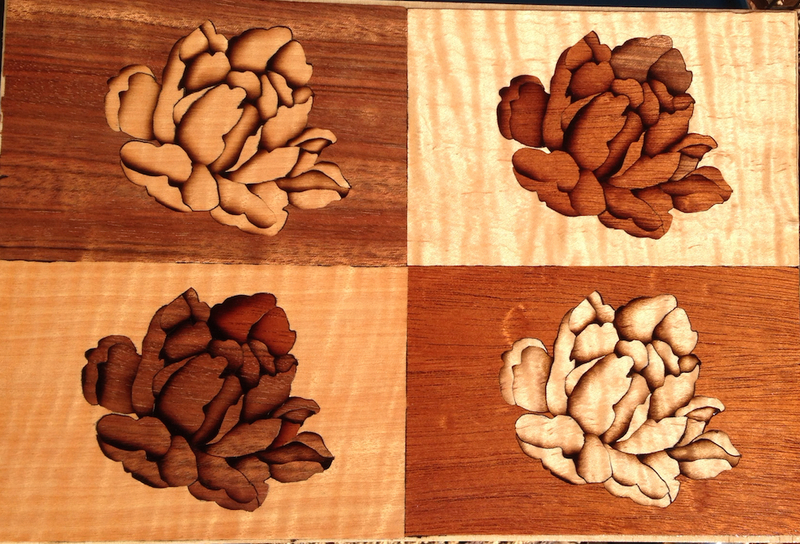 I may or may not actually inlay them, I don’t really see a point as they are only about 1/16″ thick. I drew up a simple shape that worked with the scale of the nuts and front jaw, and cut them out of some 16 gauge brass stock I had on hand. Simple stuff. 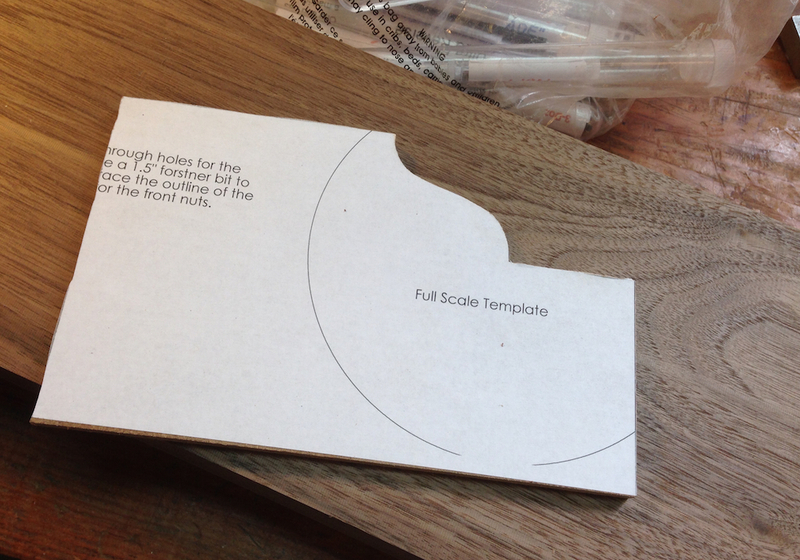 I updated my plans, mostly to add full scale templates for the escutcheon plates. I like that word, I’m going to use it more often. 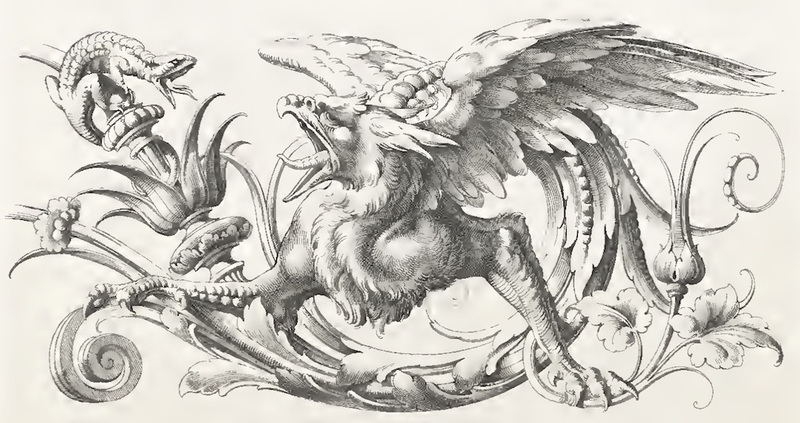 Escutcheon. There, mission accomplished. This is a pretty simple project, even for me. 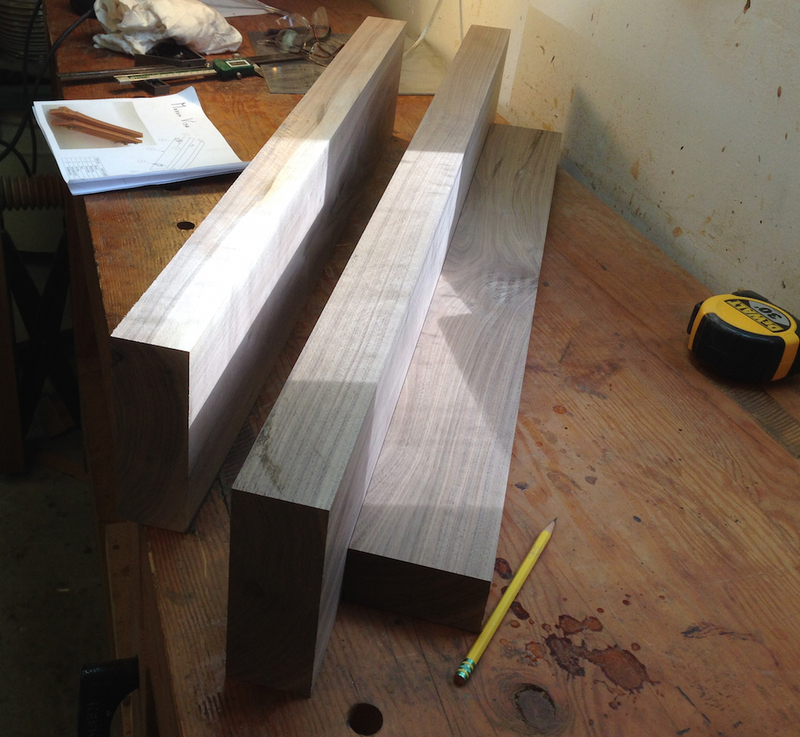 I cut and milled two 8/4 rough Eastern Walnut boards to exactly 2″ thick. One is cross cut at 38″ the other at 32″. These make up the rear and front vise jaws respectively. The rear jaw is 5.5″ wide, and the front is 5.75″ wide to allow it to register with the bench front. 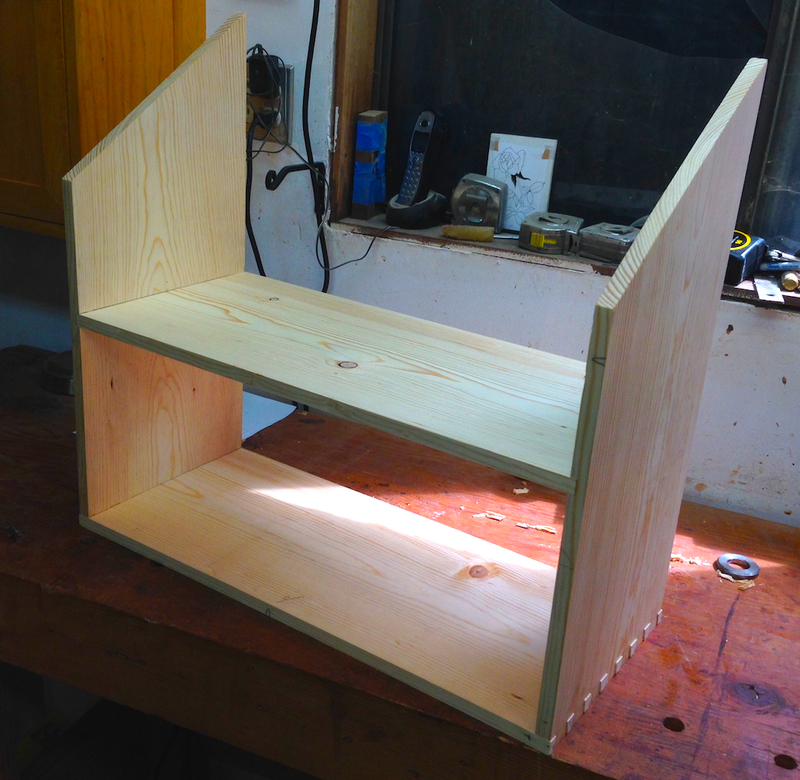 I also prepared a piece at 1.75″ thick x 3″ wide x 32″ long for the rear support. 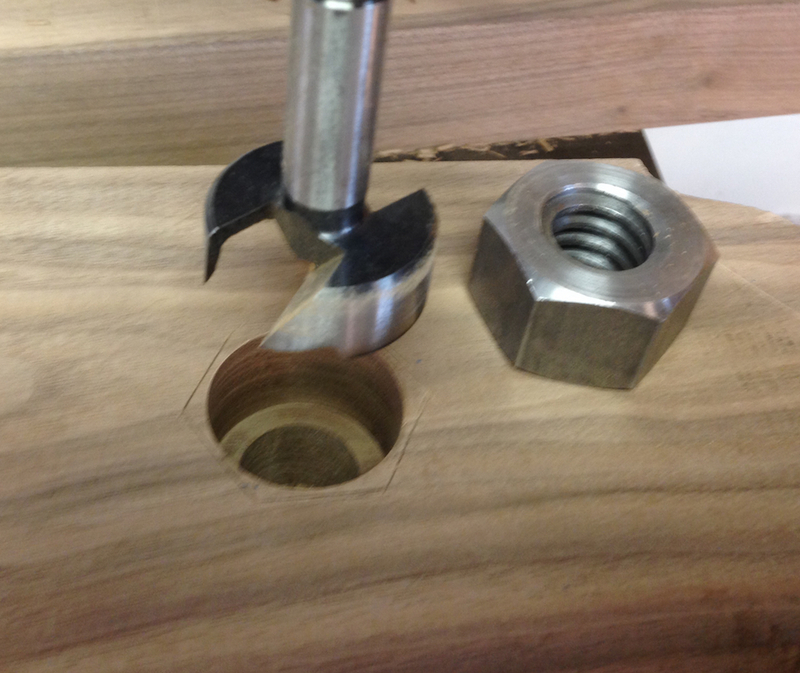 The rear support has to be thinner to allow the giant nut to turn on the back when assembling the vise. 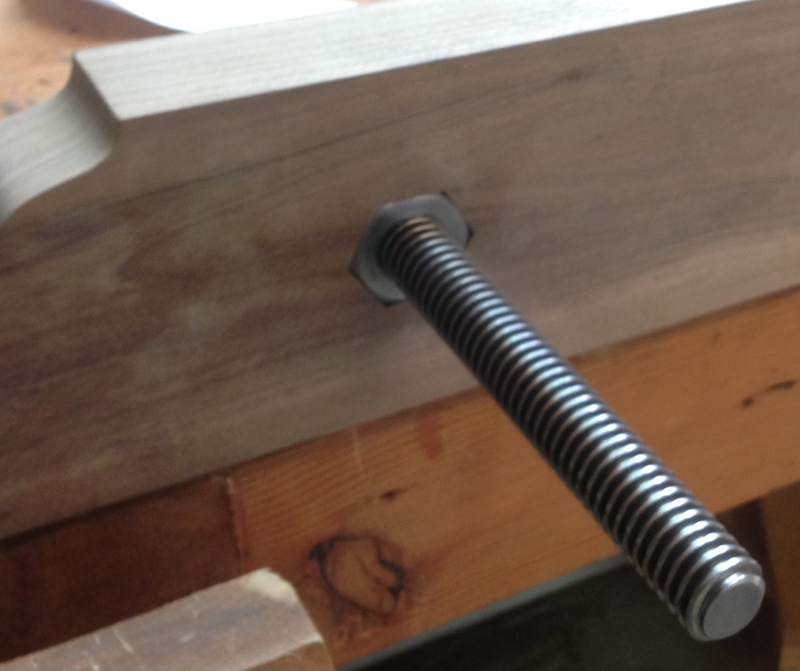 Next I wanted to add a little detail to the ends of the rear vise as shown in the plans I posted yesterday. You can lay this out with a compass – and in fact I did at first, but I liked the proportions in the full scale template I drew up better. 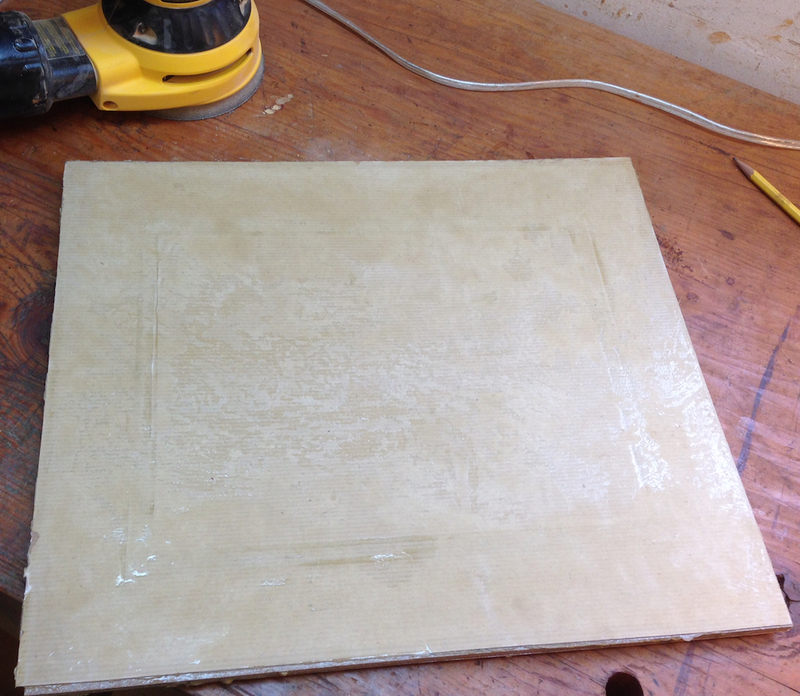 I did the usual trick of gluing it to 1/4″ MDF with Super 77, and cutting it out. Then I transferred it to the rear vise jaw and cut and shaped the ends. 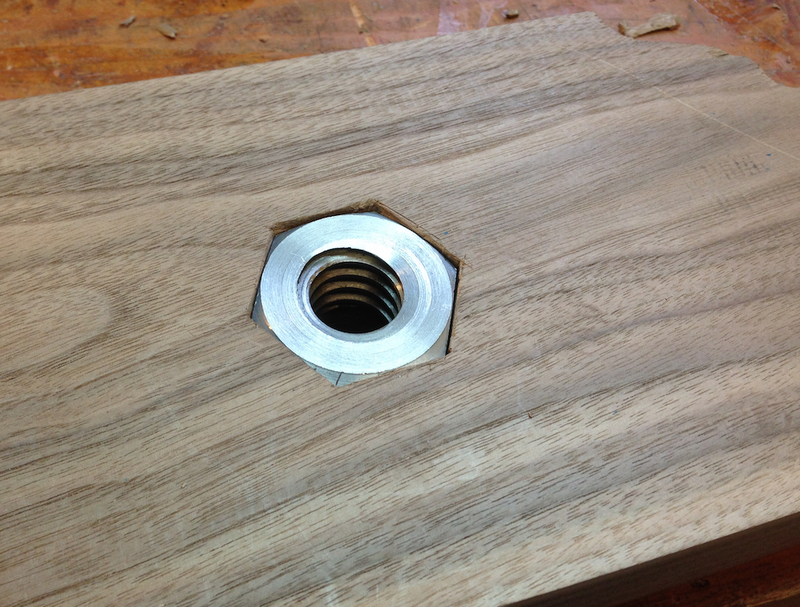 Next I drilled the 1″ holes for the threaded rod, then strived the outline of the nut to the inside face of the rear jaw. 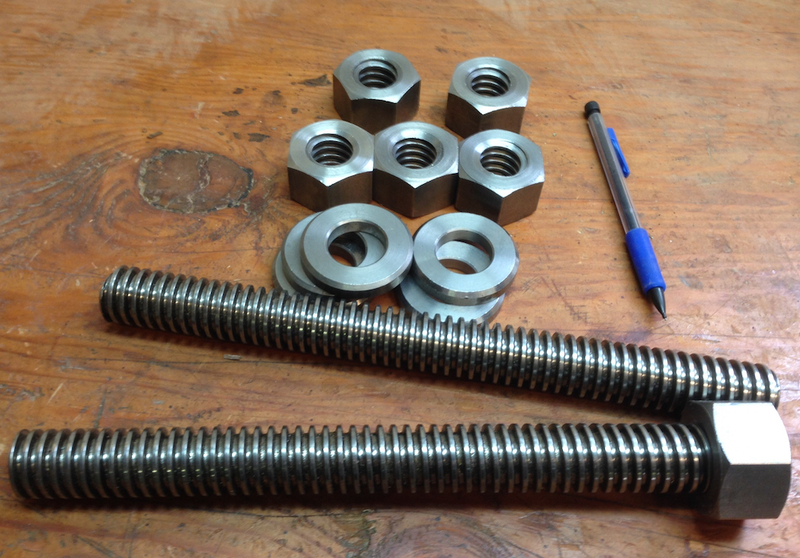 The threaded rod is held in place on the rear jaw by two nuts, one recessed into the face of the rear jaw, and one tightened against the back. 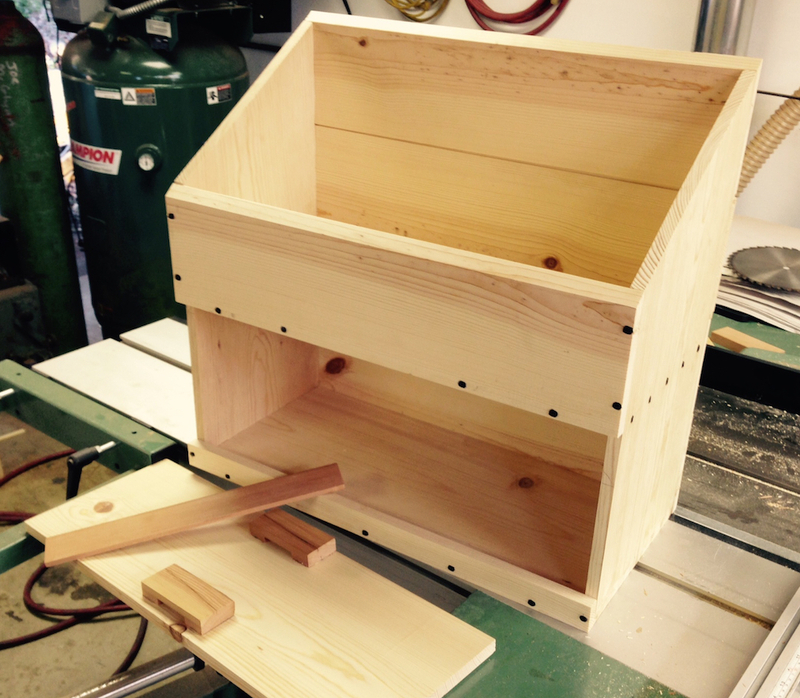 Same construction approach as the Benchcrafted vise. 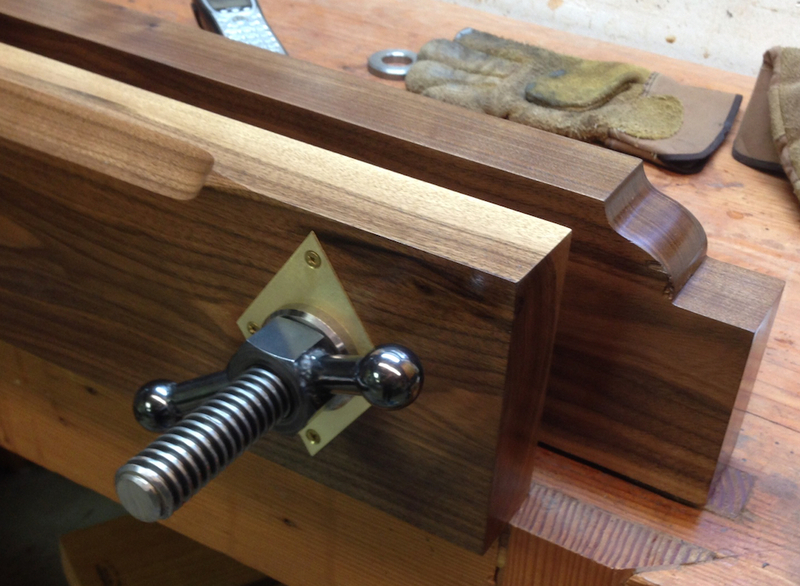 Transferring the outline of the nut to the inside face of the vise. 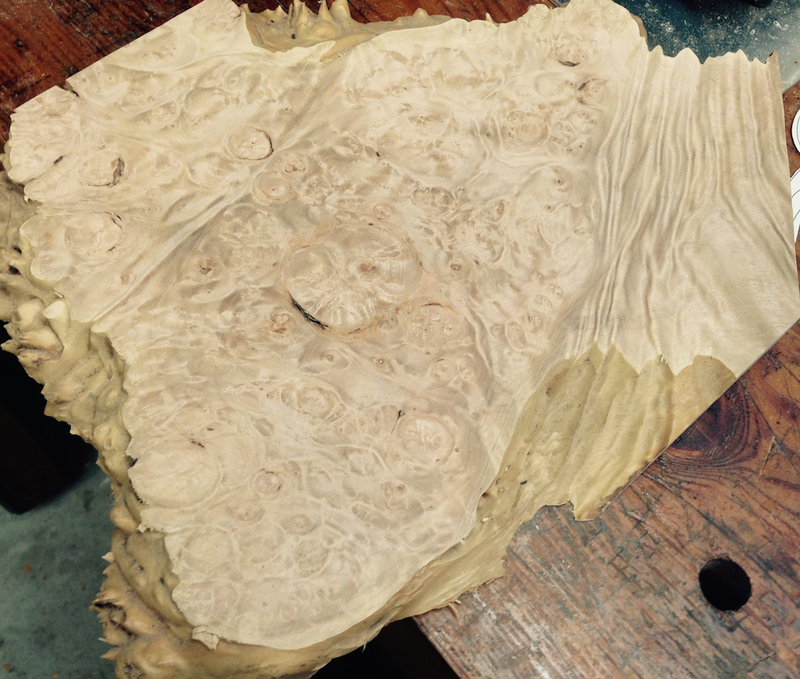 I used a 1.5″ Forstner bit to remove the bulk of the waste. 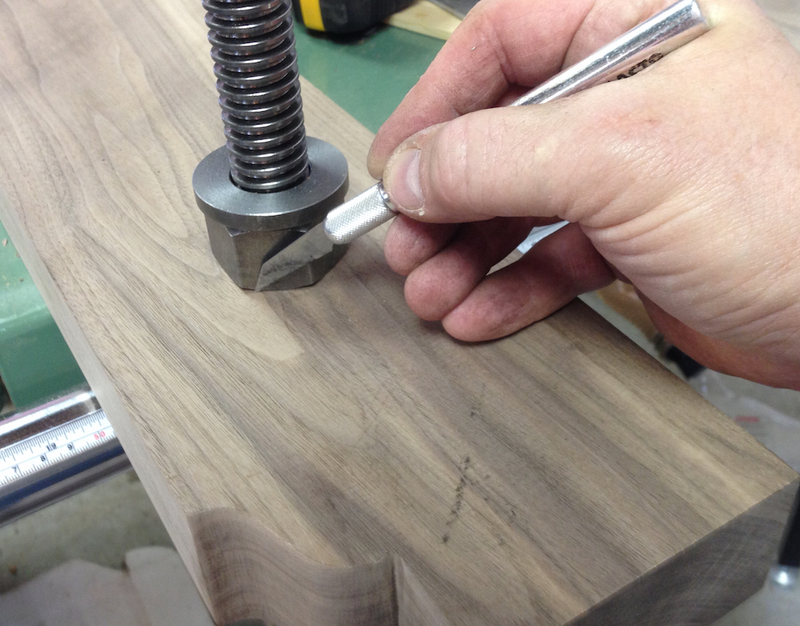 The nuts are 1.625″ wide across the flats and 1″ thick, so I drilled to a depth of 1″. Then I used a chisel to chop out the rear of the waste until the nut just slid into the cavity. This worked out really well, it’s a nice fit. 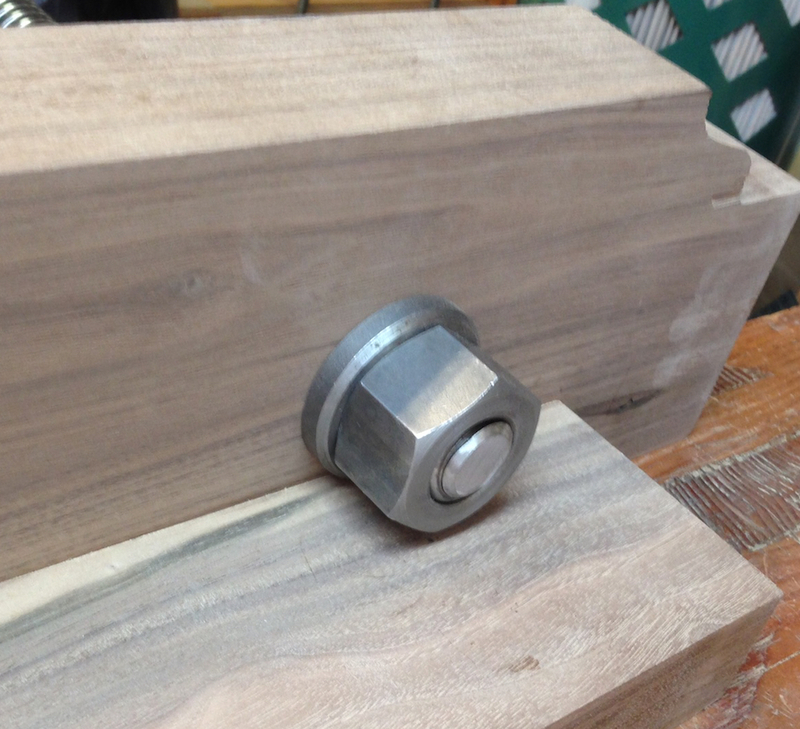 Nuts recessed into the vise face. I double checked the clearance for the nut on the back — I figured out that it should clear in CAD, but wanted to be sure before I glued the brace on. 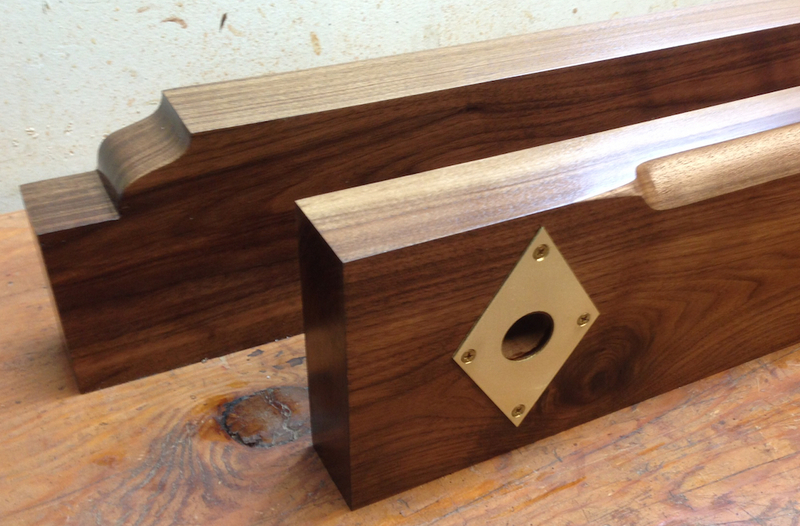 With that done, I’m pretty much done with the woodwork for the vise. Just a little detailing after the glue dries, I need to make the big wing nuts for the handles once I get my welder fixed, and put some finish on it. This should be a useful tool one completed.